After all the upheaval in the previous couple of years (iTunes, YouTube, download charts), the music industry started to settle down in 2007 as everyone got used to the way things would be from now on. Meanwhile, after a relatively sedate 2006 for me personally, 2007 was another big year as, thanks to some well-timed pregnancies on my two immediate superiors' parts, I suddenly found myself as stand-in editor of TV WEEK. To start things off, a bunch of under-the-radar electronic tracks, including this song from Martin Eyerer and Chi-Thien Nguyen (aka Chopstick). Vocals on the song are supplied by Philippe Zdar, one half of French duo Cassius. Originally released back in 2005, this single by the British dance act received a new lease of life in 2007 thanks to a remix from Mylo (who'd featured Freeform Five on 2006 single "Muscle Car"). However, it was this remix by Richard X that caught my attention. Part of a new wave (pun intended) of '80s-influenced bands - we'll see another shortly - New Young Pony Club are, despite their name, a British group and they were actually signed worldwide by Australian label Modular. "The Bomb" gained even less exposure than debut single "Ice Cream', which received a second re-release in 2007 but still only managed a number 40 chart placing in the UK. He'd released a number of high profile dance tracks prior to 2007, but American DJ and producer Armand Van Helden started to struggle with the singles from his seventh album, Ghettoblaster. This track, which samples the original version of "Do You Want It Right Now" by Siedah Garrett, was the best performing single released - a UK top 20 hit - but the following year, a greatest hits album was issued and Armand turned his attention to new projects, notably forming Duck Sauce with A-Trak. Here's that other '80s-inspired synthpop group - critically beloved but under-performing Canadian band Dragonette with their debut single, "I Get Around". Unlike the previous four artists, we'll be seeing Dragonette a fair bit in coming year-end countdowns as they quickly became one of my favourite acts. Just when things had been going so well for my favourite Blue solo star, Simon's singles suddenly went from being big hits to barely scraping into the UK top 40. This double-A side, which featured the title track of his second album, would end up being his final solo release - and it is only included here due to non-album track "Ride The Storm", which served as the theme to forgettable comic book film Fantastic Four: Rise Of The Silver Surfer. After their collaboration with Simian (which just missed my top 100 for 2006) put them on the map, French duo Justice released what is still one of their biggest hits with this track from the annoyingly titled † album. Featuring an unlikely mix of kid singers, Michael Jackson lyrics and various samples, "D.A.N.C.E." manages to sound both child-like and cool at the same time. You wouldn't think a fifth single from a hit album would cause such a stir, but a plagiarism lawsuit erupted over this track from Loose when producer Timbaland was accused of lifting a synth line from... well, actually, it's all rather confusing since it involves original track "Acidjazzed Evening" and a remix of that song for the sound-generator chip of the Commodore 64. Despite all the fuss, "Do It" was much less successful than any of the album's previous English-language singles. Whatever did happen to Gia Farrell? The singer of this perky tune from the Happy Feet soundtrack was dropped by her label after the song - which was a big hit in Australia - failed to perform in larger markets like the US. Gia (real name: Jeannie Bocchicchio) was last seen auditioning on American Idol in 2012 and now performs in a band called Blackbird. 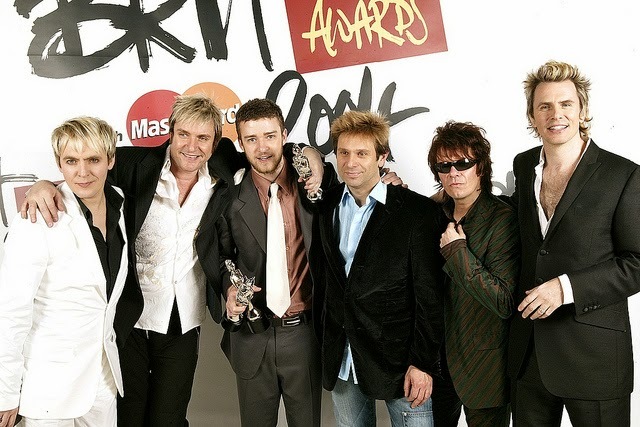 With their line-up settled to the quartet of Simon Le Bon, Nick Rhodes, John Taylor and Roger Taylor following a bust-up with guitarist Andy Taylor, Duran Duran did what any decades-old band wanting to appeal to a younger generation would do - they turned to Timbaland, Danja (who co-wrote and co-produced Britney Spears' 2007 comeback single, "Gimme More") and Justin Timberlake (who wrote and produced "Falling Down" with the band) to work on their 12th studio album, Red Carpet Massacre. In fact, it was this choice of musical direction - amongst other factors - which contributed to Andy's second departure from the band. A year earlier, despite original fans abandoning the band claiming they'd sold out, Razorlight had been the darlings of the British music scene. However, the tide quickly turned against them, mainly as a result of singer Johnny Borrell's propensity for self-aggrandisement, and press coverage began to be not quite as favourable. No doubt that contributed to this single becoming the band's first to miss the UK top 40 since debut release "Rock 'n' Roll Lies". It had been three years since we'd last heard from rap-rockers Linkin Park, who returned doing what they did best - making epic-sounding tracks like this first taste of third album Minutes To Midnight. The song also appeared on the soundtrack to the first Transformers movie - a pairing that would be repeated four years later for the sequel and again in 2011 for the third film in the franchise. The law of diminishing returns was in effect with the singles from Eskimo Joe's Black Fingernails, Red Wine album - with each performing worse than the one before. But, while fourth single "Breaking Up" didn't even manage to crack the ARIA top 50, I preferred it to predecessors "Sarah" and "New York", and fifth single "London Bombs". You have to go right back to 2002 to find the last time Craig David had released a big dance track ("What's Your Flava?") with the British singer's output consisting of increasingly soppy ballads and bland midtempo tunes ever since. But, with a little help from David Bowie's 1983 classic, "Let's Dance", Craig got his groove back. The first stage of their career behind them (as marked by their premature 2006 greatest hits collection), Girls Aloud continued to up the ante in 2007 with fourth album Tangled Up, which featured this typically unconventional lead single and "Call The Shots" (number 31 on this list). Of the bazillion singles that Beyoncé released from second album B'Day, this was one of my favourites - but only because it came with an astonishingly re-inventive remix from Freemasons, who seemed able to turn any old R&B track into a dance floor stormer. Their work on the otherwise pedestrian "Green Light" followed their transformation of B'Day's lead single "Deja Vu". In Part 2: solo releases from the singers of two very different groups, and a hotly tipped Australia duo add some electro to their power-pop sound and finally enjoy international success.